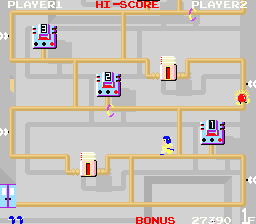 Wily Tower © 1984 Irem Corp.
A platform game where you must climb around lattice of pipes to deactivate power switches for main computer while avoiding robots. Jump on generators to send out disrupters and kill robots. This game is also known as "Atomic Boy". In difference to "Atomic Boy", Wily Tower has NO storyline.